Now as great as the cash free life sounds, in today’s world credit cards are often required. Instances such as hotel reservations, plane reservations, renting a car, or even opening a bar tab requires a credit card. For those of you whose credit isn’t so great, coming off of a bankruptcy, or do not qualify for a credit card you do have an option. Secured credit cards are ideal for individuals who normally would not be issued a card. They normally require a deposit, which often doubles as your spending limit and have an annual fee. I was doing some research and came across www.creditcardsearchengine.com . This site allows you to compare and contrast the different providers of secured credit cards. It is important to do your research on secured credit card companies. It would be ideal to get a card with no application fee, low annual payments, as well as a decent interest rate. It is important to remember that secured credit cards will have higher interest rates than unsecured credit cards, so compare secured credit card interest rates to other secured credit card rates. Also read the fine print on the applications and contracts, know what terms and conditions you are agreeing to. It is not unheard of for people to have a limit of zero on their card when they receive it because their deposit was eaten up with hidden fees. Do not keep a balance on these cards, the interest will be high, make a few essential purchases a month and pay them off in full. 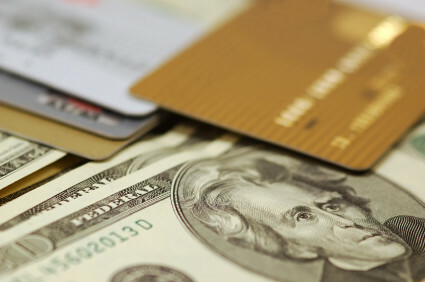 Make sure your secured credit card reports to all three credit bureaus. This is one of the most important features of a secured credit card; it is a stepping stone to building credit. With months of regular payments, no delinquencies, and reports to the credit bureaus, you will qualify for an unsecured credit card. Get rid of your secured credit card and follow the advice I mentioned above. The interest will be lower, and you can continue to build your credit.